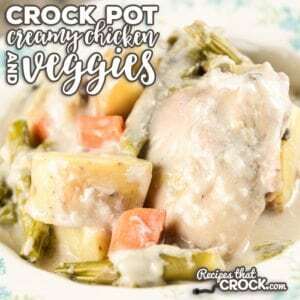 Crock Pot Creamy Chicken and Vegetables - Recipes That Crock! Crock Pot Creamy Chicken Vegetables is an easy one-pot slow cooker meal full of fresh veggies! This is the perfect family dinner idea for quick and easy weeknight meals. Cris here. Do I have a treat for you! I just love a good one pot meal and one that cooks all day long is even better! This Crock Pot Creamy Chicken and Vegetables Recipe comes from a recipe called “Creamy Dreamy Chicken” in Gooseberry Patch’s Busy-Day Slow Cooking. It caught my eye because it used some different ingredients than what you typically find in one pot meals for slow cookers. It calls for green onion and asparagus instead of a typical white onion and green beans (which would also be good I bet 😉 ). Psst… Mikey made you a video on this one! The verdict? The family just loved it! It is one of those super simple, super delicious meals. This recipe needs a full 6 quart slow cooker. We used one our favorites. The non-stick surface was perfect for this dish. We used boneless skinless chicken thighs but you could use breasts or tenders. If you don’t like one of the veggies listed try substituting something you like. For example, I would bet snow peas might substitute well for the asparagus. This Crock Pot Creamy Chicken and Vegetables recipe is the perfect one-pot family dinner meal! This sounds pretty good to me. I would use chicken breast meat…any suggestion on that? Whole, cut in pieces…etc…? Also, how do you think it would be to use 1 can cream of chicken and 1 can cream of mushroom? Mikey, what is your all time favorite slow cooker recipe? I love watching your videos!! Hi Kim- Whole chicken breasts will work fine and mixing cream soups will also work.